Do you know which food additives to avoid? 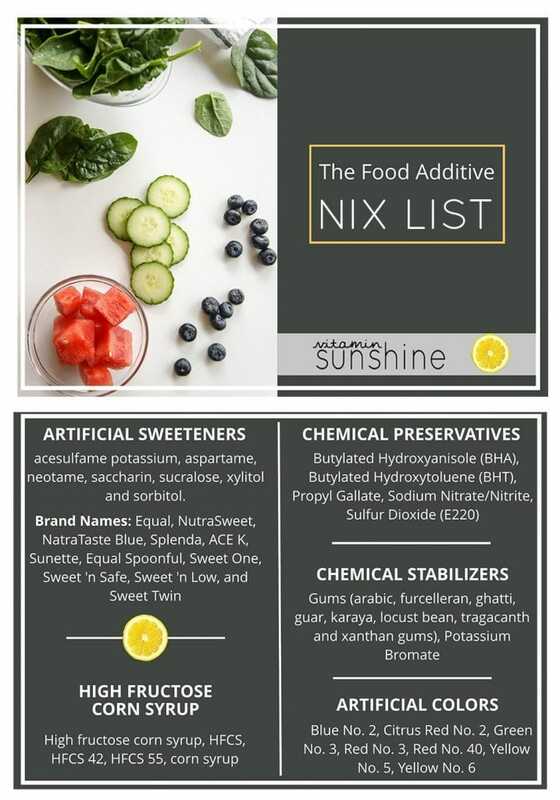 This helpful Food Additive “Nix List” gives you a guide on which additives are known to be harmful, how to identify them on food labels, and there’s even a free printable so you can keep this information in your wallet. I’ve always intended for Vitamin Sunshine to be more than just a recipe blog. I am passionate about healthy living, and want to share the information I have gathered over the years. My road to health began when I was young. I was often sick, and very overweight as a young teenager. At a young age, I learned to value my health because I had two stark versions of myself to compare. Sick, overweight, and unhappy– and healthy, strong, and thriving. (Read more about my journey to health here). I truly believe that if you only choose 1 way to care for yourself, it should be with your diet. The foods you eat have such a profound impact on your health, your weight, and even your emotional well being. Have you ever heard that losing weight is 90% clean eating? Learning to cook, and finding ways to incorporate clean eating into the other aspects of your life is an incredible gift you can give yourself. 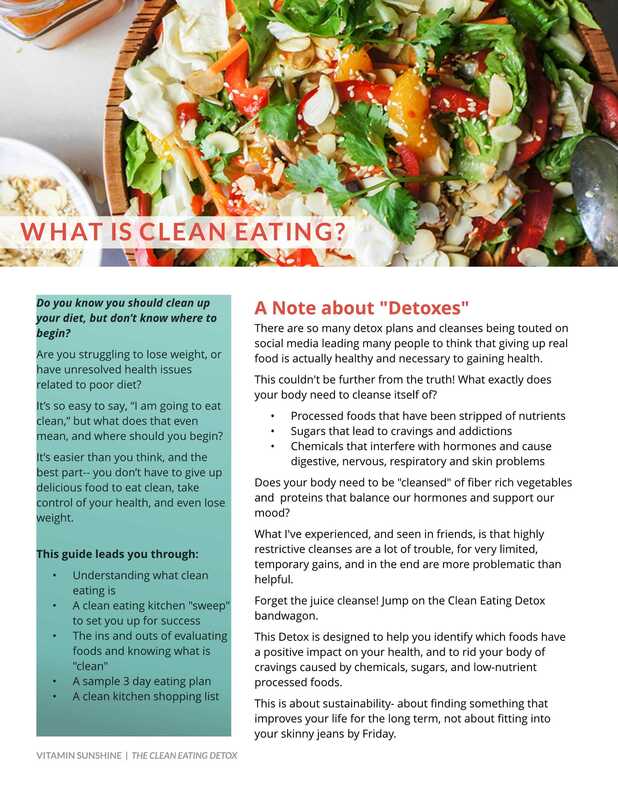 In an effort to help more people learn how to transform their lives and diets, I am writing a new eBook, The Clean Eating Detox, which includes an overview of what clean eating is, a chapter called “The Clean Eating Sweep,” that teaches you how to evaluate the items in your kitchen to determine what should stay and what should go, and even a sample 3 day meal plan with recipes and a shopping list. (To receive a copy as soon as this is released later this month, sign up for my mailing list). I know one of the most difficult things about starting a new lifestyle is knowing where to begin, and this guide is meant to help you understand which foods are clean and help boost health, and which foods should go. If you’ve heard the “shop the perimeter” advice, that’s a great way to view clean eating. The foods around the edge of the grocery store– produce, meats, dairy and eggs, those should form the basis of a clean eating diet. However, all of us need a little help (and variety!) at times. Let’s get real here- even I buy packaged foods! I’d love to say I make everything homemade, but that’s just not the world we live in. 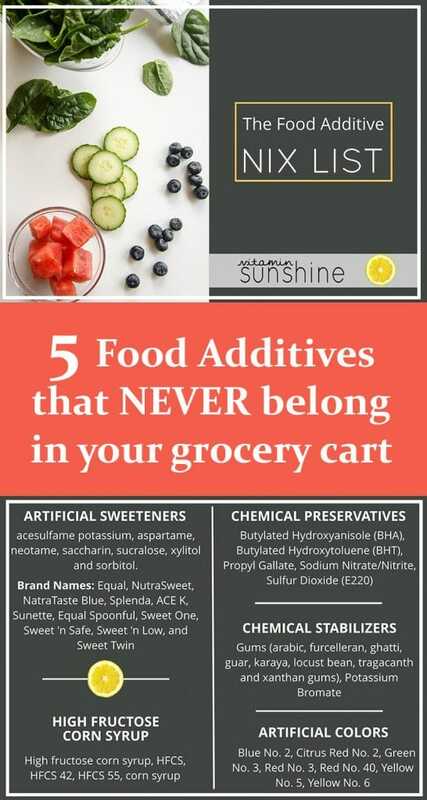 Below is an overview of the worst offenders in packaged foods- food additives to avoid if at all possible. As a bonus, I’ve included a print out you can fit in your wallet to help evaluate packaged foods at the grocery store. What we can do is be mindful of what packaged foods we allow into our homes and bodies. Artificial sweeteners are made in a lab, not by nature. Not only have they been found to actually cause weight gain (because our bodies crave calories when we taste something sweet, leading to overeating), but they have also been linked to cancer, and cause digestive issues in many people. Why take the risk? There are so many healthier alternatives to sugar. Scan Labels For: acesulfame potassium, aspartame, neotame, saccharin, sucralose, xylitol and sorbitol. Also look for brand names: Equal, NutraSweet, NatraTaste Blue, Splenda, ACE K, Sunette, Equal Spoonful, Sweet One, Sweet ‘n Safe, Sweet ‘n Low, and Sweet Twin). Common Food Items Containing Artificial Sweeteners: diet sodas, reduced calorie juice, 0 calorie drinks like iced teas, sugar free ice cream, sugar free candy, foods marketed towards diabetics. 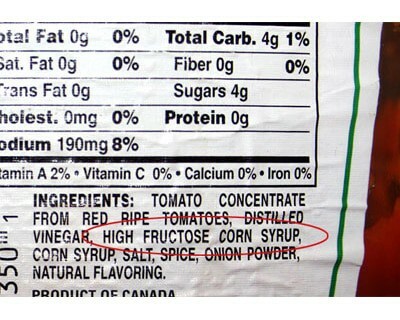 Another sweetener to avoid, high fructose corn syrup is made by separating the starch from corn, and then introducing it to enzymes that digest the starch and convert it into sugar. Since the advent of high fructose corn syrup, and the raising levels of it in our processed foods, the rates of obesity, cancer, heart disease, dementia, tooth decay and liver failure have all soared. 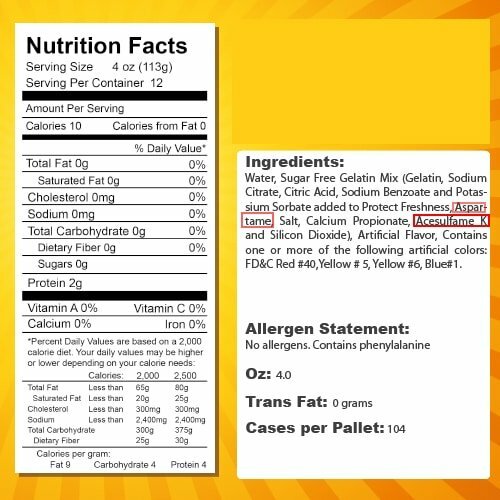 Plus, most corn is GMO, meaning this sweetener is far from it’s natural or “clean” state. Common Food Items Containing HFCS: cereal (most Kelloggs brand), Stove Top Stuffing, chocolate milk, fruit drinks like Capri Suns, sodas, cranberry juice, whole grain breads, frozen waffles, hard candies, packaged cookies, Nutra Grain Bars, Wheat Thins, yogurt, cool whip, pickles and relishes, ice creams, syrups, processed meats, salad dressings, bbq sauce, and canned vegetable soups. Until recently, hydrogenated oils were a much understudied food additive. They are made in a lab by “hydrogenating” an unsaturated oil molecule, which makes a fat that is liquid at room temperature (like canola oil) behave like a saturated oil (like butter). Now wait- if we want more unsaturated fats in our diets, why turn them into saturated ones? They are added to processed foods to increase the shelf life and stabilize flavors. Scan Labels For: partially hydrogenated vegetable oil, hydrogenated coconut oil, hydrogenated vegetable oil. Also check nutrition labels for the amount of hydrogenated oil. Even if the nutrition label claims to have “0 gram”, a hydrogenated oil still might be used in a small amount. If any nutrition label gives you flashbacks of chemistry class, leave it on the shelf or toss it from your kitchen. In the mid-1900s, food scientists were overjoyed with sudden “breakthroughs” to extend shelf life and enhance flavors in processed foods. The rise of these food technologies has accompanied the rise of poor health and an obesity epidemic. I often hear the argument claiming, “but life expectancy is longer than ever!” Yes, it is- but this is due to advances in medical care. Imagine what a combination of better medical care and clean eating could accomplish! Butylated Hydroxyanisole (BHA) & Butylated Hydroxytoluene (BHT): Both ingredients prevent oils from going rancid, but are linked to cancer. Propyl Gallate: This is used in combination with BHA and BHT to extend the shelf life of oil-containing products. It’s also carcinogenic. Sodium Nitrate/Nitrite: These chemicals help preserve the color of meat. However, when heated to high heats, these compounds are carcinogenic. Sulfur Dioxide (E220): Sulfur Dioxide is added to foods to maintain color and enhance shelf life. It’s use has been banned on foods that are consumed raw. It is linked to respiratory problems and also destroys many vitamins in the foods it’s added to. Gums (arabic, furcelleran, ghatti, guar, karaya, locust bean, tragacanth and xanthan gums): Gums are added to packaged foods to improve texture and increase shelf life. Not only is there a high incidence of allergies to these additives, but because many of these are “highly effective laxatives,” they cause digestive upset, especially when consumed in larger amounts. Most gums have been evaluated as non-harmful, but cause problems in individuals with digestive problems. Potassium Bromate: This is added to bread doughs to stabilize the dough, but it has been banned by many countries, including the EU, Canada, Sri Lanka and South Korea, because of it’s link to cancers. Scan Labels For: Anything that reminds you of chemistry class, or ingredients you can’t pronounce or have never heard of. 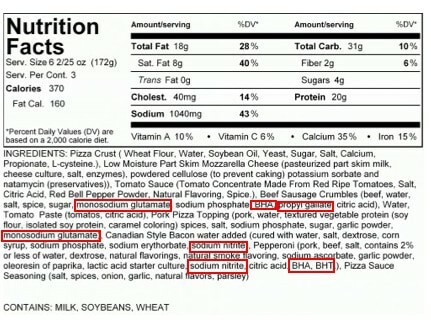 Most ingredients listed as initials are chemical compounds. Artificial colors are often found in foods that are low in nutrient value – think packaged candy and cookies. These dies have been linked to cancer, but also to behavior problems in children (ADHD) and allergies. Whole foods with dark pigments are the ones with the highest levels of antioxidants – think kale, beet root, turmeric and blueberries. With these healthy options, why rely on chemical alternatives? To prevent these ingredients, shop at Trader Joe’s and Whole Foods, two stores that ban all products containing these harmful substances. Common Food Items Containing Artificial Colors: soda, juice drinks, margarine, candy, bakery items like cakes and cookies, cereal (Kelloggs is another big offender! ), flavored yogurt (eat plain instead! ), smoked salmon, flavored applesauce, salsa, salad dressings (make your own! ), and pickles. Print this list to keep with you! 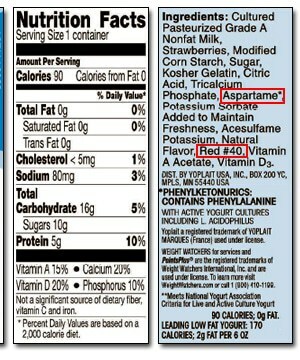 If this helps you understand which food additives to avoid, please share it on FB or Pinterest! 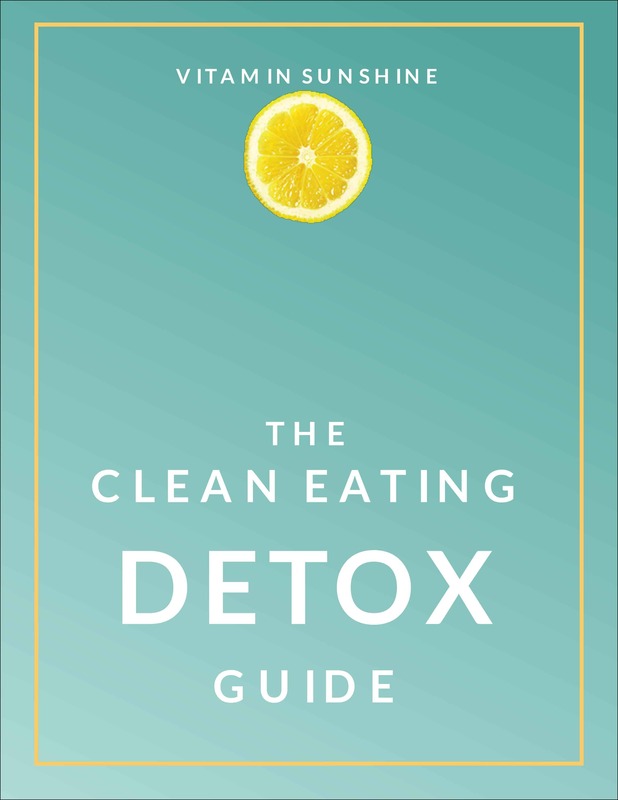 To be among the first to receive a copy of The Clean Eating Detox, sign up for my mailing list. Thank you for the useful info! We are already expert label readers because we look for allergens. It should be fairly easy to add these to the list of what not to buy! Thanks again! My life threatening peanut and soy allergies are to thank for my expert label reading skills! I'm glad this is helpful as well. I'm pretty aware of what's in our food, but it's taken LOTS of research! It's crazy how much work we have to do in order to avoid the bad stuff! I know-- it's sad our government doesn't do more to protect our health. Maybe it would if we had a national healthcare system they were footing the bill for. I love this post! Very informative and helpful :) Pinning the graphic to remember it! LOVE this nix list! I agree that clean eating can do heaps for your wellness and keeping your eyes peeled for these additives, chemicals and nasties is super important! Thanks Lisa! Just making this list has made me more diligent in checking labels, even though it's been a long-time habit of mine. I've bookmarked this - so many great ideas to make a healthy start! Thanks Rupal. I am glad so many readers are finding this list helpful. very much needed today. This is a lovely post post and the graphic just makes everything so easy to remember! Great info! All things we always need to remember! I think it's great to avoid additives and preservatives where possible. I already scan for gluten, HFCS, artificial sweetners, and dyes. I'll print this as a reminder for all the other things! Gluten can be such a tricky one-- you need a list of just the things that contain it! Thanks for letting me know you found this helpful!